Editor’s Note: To spread bee awareness in honor of National Honey Month, here’s a report on the state of honeybees in the U.S. compiled by our friends at saveonenergy.com. Click here to see the original article and citation links. One out of every three bites of food relies on the hard work of the mighty honeybee. The honeybee is a diligent worker, pollinating 70 percent of the crops that contribute to a significant quantity of the world’s food supply. However, their numbers are in fast decline, and that spells disaster in more ways than one. Even Cheerios has pulled the honeybee from their boxes of cereal to bring awareness to this cause. From the food they produce to the jobs they create, honeybees have a bigger impact on the U.S. economy than you might think. Curious what all the buzz is about? Continue reading to learn more about the real impact of honeybees in America. RATES OF DECLINE ACROSS THE U.S. The honeybee population has been in steady decline for years, and since 2015, their population has been declining at an even more alarming rate. Between January and March 2015, nearly half of the honeybee population in Ohio was lost due to potentially 60 different factors, and more than a third of the honeybees in Illinois died. Between April and June 2015, between 2 percent and 19 percent of the honeybee populations across the entire U.S. died. During the summer months, nearly a third of the honeybees in Arkansas died, and between October and the end of December, 40 percent of the honeybees in Kansas had perished. Between January and March 2016, honeybee populations were still on the decline, and almost half of the remaining bees in Oklahoma disappeared. The National Agricultural Statistics Service and the USDA have recorded losses from 29% to 45% between 2010 and 2015. Despite the efforts of beekeepers across the country and research to understand these trends, between 12 percent and 18 percent of the honeybees in the U.S. were lost each quarter between March 2015 and March 2016. So, what’s causing all of this damage to the honeybee population in the U.S.? The No. 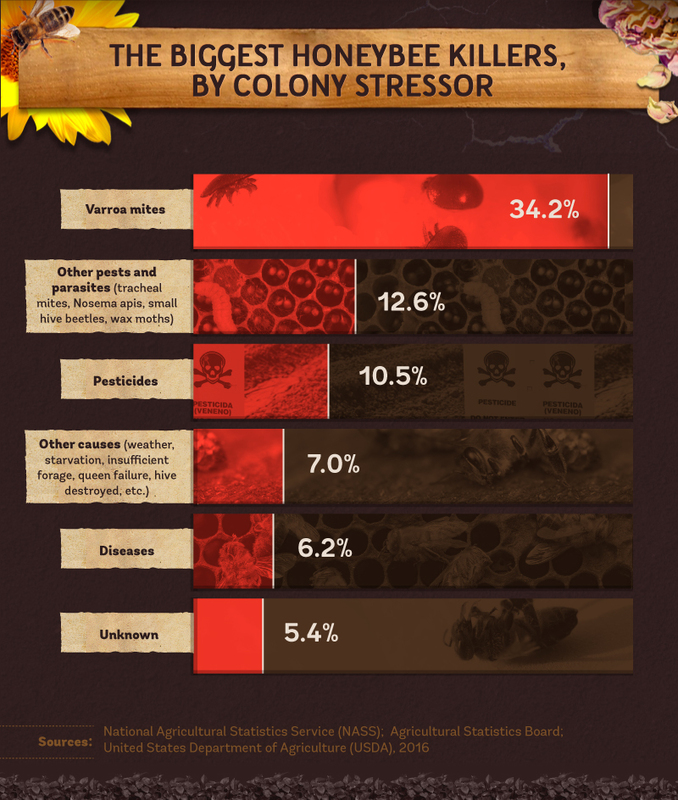 1 stressor on honeybee colonies is varroa mites. Largely found in Florida, these mites feed off of adult honeybees and those unhatched or maturing (called brood). The mites actually develop on the honeybee brood, allowing them to overtake adult bees as they grow, and move from colony to colony by attaching themselves to agricultural workers and drones. Other pests and parasites like tracheal mites, small hive beetles, and wax moths, as well as the disease nosema, are also having a negative impact on the health of the honeybee population. Hive beetles are native to the sub-Saharan areas of Africa but have been found outside of the region around nests of the honeybee. Pesticides, weather, and diseases have also had significant adverse impacts on the honeybee population in the U.S., together accounting for over 20 percent of colonies lost in 2015 and 2016. The importance of honeybees isn’t just about bees or honey. 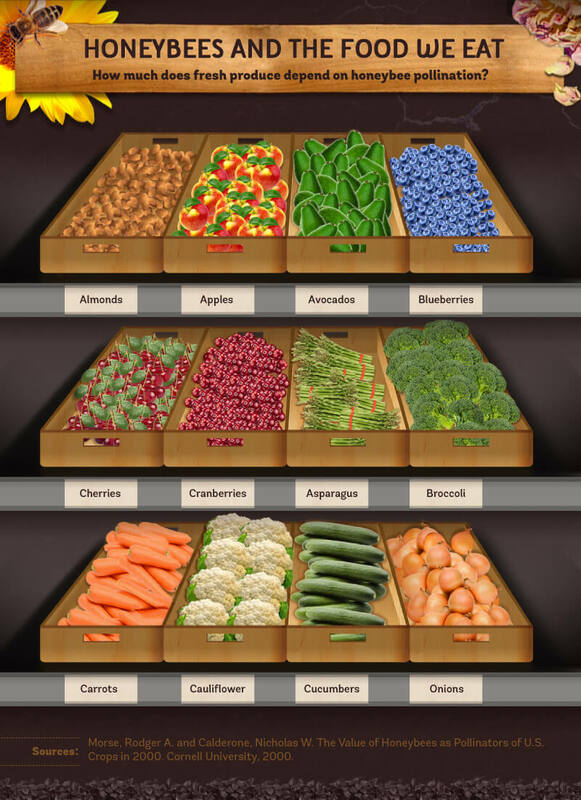 Because a third of global food production is reliant on pollinators, many of the most common fruits and vegetables are dependent on some aspect of the honeybee pollination process. 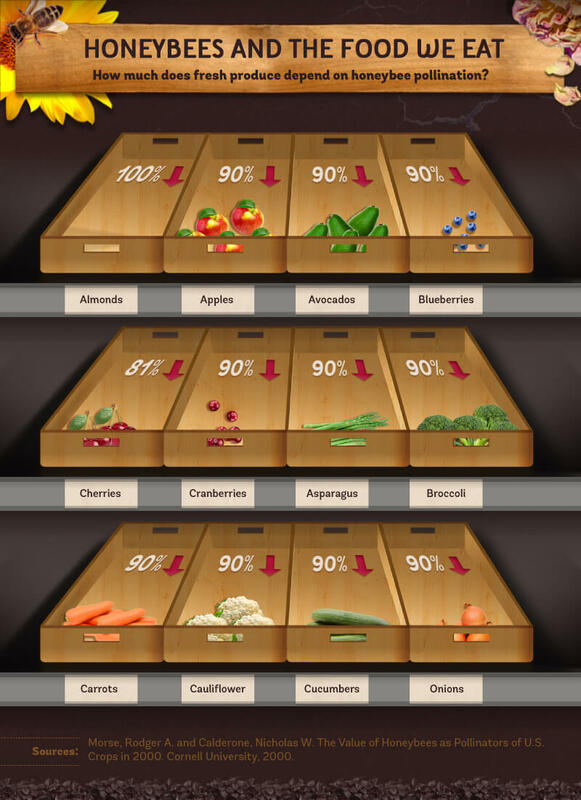 For example, almonds are 100 percent reliant on the honeybee. In fact, the relationship between bees and almonds is symbiotic. Almond trees require cross-pollination to grow, and male bees move pollen between the plants, helping them to thrive. In return, almond pollen is considered a natural form of food and nutrition for bees. Apples, avocados, and blueberries are also extremely dependent on the honeybee’s pollination skills. For avocados, while there may be only one seed in the entire fruit, more than 20 pollen grains are needed before a flower can produce one. Honeybees are also more efficient at pollinating when it comes to apple and cherry orchards compared to nectar collectors, which helps these delicious fruits mature so we can enjoy them. Losing the honeybee doesn’t just mean fewer almonds and apples for our salads and treats, it means big bucks for the U.S. economy. Because so many of the foods we eat every day are dependent on pollinators for production, losing a major player in the game like the honeybee would be devastating to our food economy. The financial impact of losing the honeybee population would be greatest in the almond industry. Combining the sale of almonds and wages of those employed to help maintain them (earning an average pay of $20,000 every year), the almond industry adds roughly $5.9 billion to the U.S. economy. 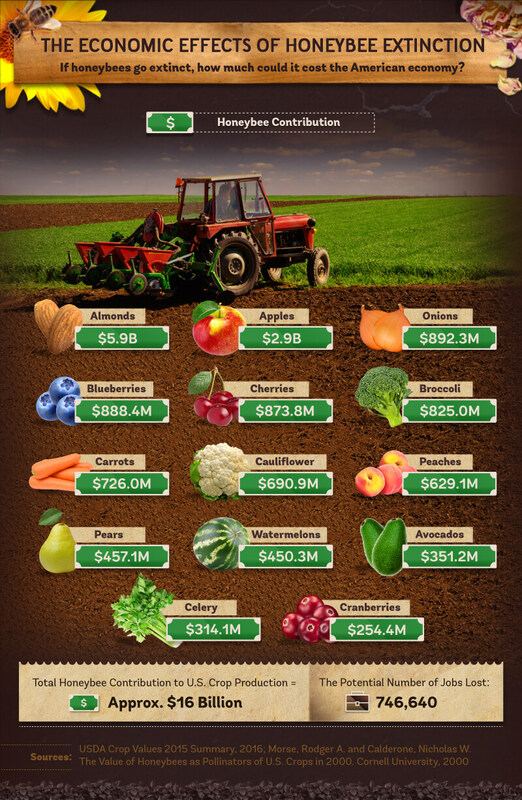 The cost of the production of apples adds over $2.9 billion every year, and the broccoli and onion industries each contribute well over $800 million to our economy. Today, 1 in 12 jobs across the country are directly connected to agriculture. In total, the honeybee contribution equates to well over $16 billion dollars a year and helps employ hundreds of thousands of people in the U.S. The honeybee is a mighty little creature. While you may see one and think nothing of it, honeybees are hard at work for most of their lives, helping to keep the food we eat every day flourishing and readily available for our consumption. While they may not realize it, they also contribute to our economy by helping to grow fruits and vegetables and provide working opportunities for hundreds of thousands of agricultural workers across the country. However, despite their integral place in our agricultural society, honeybees are dying off at a profound rate. While we may recognize some of the causes, there is still more work to be done to correct the effects and truly understand the rate of their demise. If you want to help change their fate, consider reducing the pesticides you use in your home garden around plants that bees might be pollinating, and if you have these kinds of plants, you can register your garden with the Pollinator’s Partnership database to help promote the protection of pollinators and their ecosystem. You can also help your community’s local beekeepers by buying locally grown produce. The small efforts might have a profound effect on our bee communities. The fate of the honeybees will have a much more profound impact on our economy if we don’t. 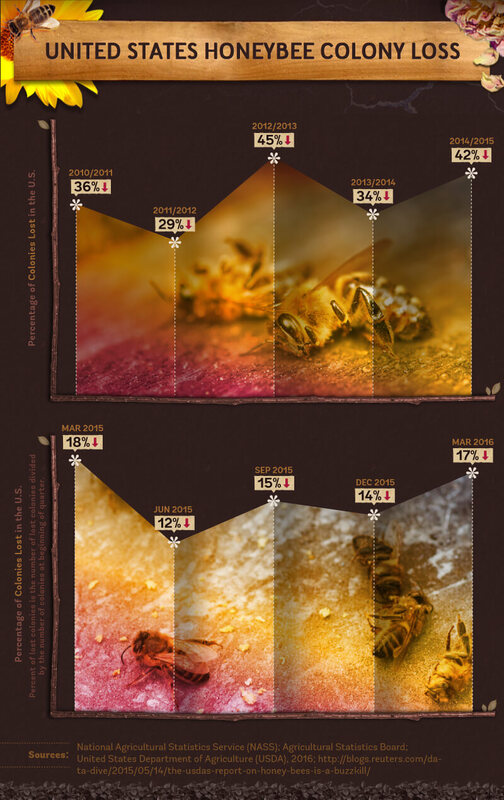 Using data published by the USDA, we visualized the instability of honeybee colonies across the United States. The 2016 USDA study that was used in this campaign reports on colony operations for agricultural purposes. A 2000 Cornell study on the honeybee’s contribution to U.S. crop production was used to visualize the reliance of U.S. crops on the honeybee as a pollinator, as well as to determine the economic impact of the honeybee on U.S. agriculture. Curious about keeping more than just plants on your urban farm? Click here for Chickens, Goats and More, a free webinar to get you started on your journey to keeping backyard animals.